Chia seeds are a small but wonderful superfood and grant a variety of health benefits. Chia is the edible seed of Salvia hispanica, a flowering plant in the mint family (Lamiaceae) native to Central America. 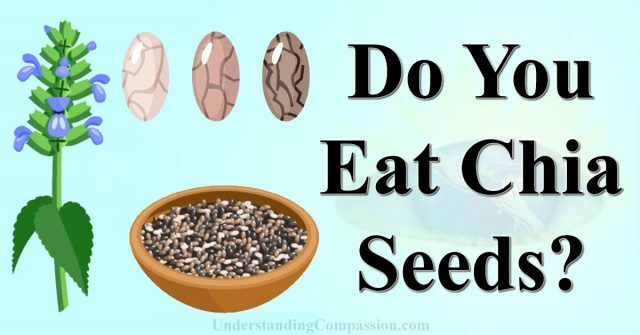 Chia seeds are oval and gray with black and white spots, having a diameter of roughly 1 millimeter. The Aztecs and Mayans ate chia seeds on a daily basis for their supposed energy granting effects, and the word “chia” itself comes from the ancient Mayan word which means “strength.” Chia seeds contain nutrients that can help combat disease, obesity, bowel obstruction and these little wonder seeds can even enhance weight loss. They’re low in calories and can give a tasty and healthy boost to a wide variety of different meals. Chia seeds have grown in popularity among health conscious eaters in part because they are full to the brim with healthy nutrients. Adding chia seeds to your diet makes it easier to get the recommended daily amounts of numerous vitamins and minerals. Each chia seed is packed full with antioxidants, and research has shown that there are a lot of positive health benefits that come from consuming antioxidants derived from natural foods rather than supplements. Antioxidants help the body fight free radicals and prevent premature aging and certain types of cancer. The antioxidants found in chia seeds help to protect the fat molecules in the seeds, which when consumed gives the body healthier skin and stronger/shinier hair. One ounce of chia seeds contains roughly 137 calories and only a single gram of digestible carbohydrates. The low calorie and low carb content of chia seeds allow a person to get a vast amount of healthy nutrients without gaining any weight as a result. Health experts assert that chia seeds help with weight loss due to their high fiber content. The soluble fiber found in chia seeds absorbs large amounts of water and then expands in the stomach, increasing feelings of fullness and satiety, while slowing the absorption of food. While several studies of moderately obese participants on a 12-week diet containing chia seeds did not show significant weight loss results, following studies did show that chia seeds increased the levels of omega-3’s in the blood, and for participants with type 2 diabetes, consuming chia seeds daily did cause significantly greater weight loss than the placebo. 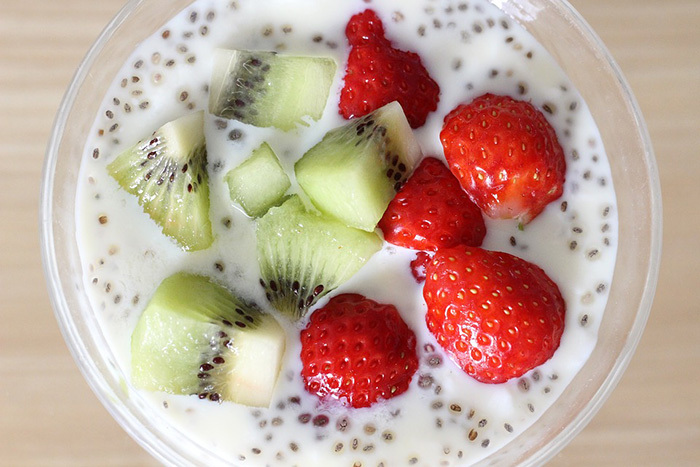 Chia seeds with kiwi, strawberry and yogurt. These miraculous little seeds are an excellent way to lower the number of inflammatory markers in the blood. Researchers discovered that introducing chia seeds into one’s regular diet leads to an average 40% reduction in inflammatory markers. As chia seeds have large amounts of fiber, protein, and omega-3 fatty acids, they may lower the risk of heart disease. While more studies still need to be conducted on the subject, studies of lab rats have shown that chia seeds lower associated risk factors dealing with triglycerides, inflammation, insulin resistance and belly fat. They may also raise “good” HDL cholesterol. Studies have shown that Chia seeds do help reduce blood pressure in people with hypertension, which is a strong risk factor for heart disease. Chia seeds regulate blood sugar levels by improving insulin sensitivity and thus lower the risk of obesity, stroke, asthma, high cholesterol, coronary heart disease, and metabolic syndrome. They help to reduce and control the number of blood sugar level spikes that occur after meals which often have adverse health effects. One serving of chia seeds can give the body a boost in energy similar to that of a popular sports drink, but without the unhealthy sugars and artificial coloring. The recommended daily amount of chia seeds is around 40 grams, divided between two meals containing 20 grams each. Chia seeds help relieve constipation as they convert into a gel when they absorb water, adding bulk to the bowel movement, softening it, and making it easier to pass. Chia seeds are full of brain boosting nutrients including healthy omega-3’s which the brain uses to make DHA fatty acids (a necessity for good brain function). Chia seeds also contain proteins abundant with the nine essential amino acids needed to keep one’s mood stable and the brain functioning at maximum capacity. Chia seeds can help improve one’s focus, energy, discipline, intelligence, ambition, and motivation levels. Try adding a small 20 gram serving of chia seeds twice daily to your meals and take advantage of their wonderful health benefits. They can deliciously be added to breads, soups, salads, sauces, oatmeal, cakes, smoothies, muffins and yogurt! Do you eat chia seeds?